Licenses. Google Code makes the following choices available. Despite the AGPL is now admitted, as OSI Director Simon Phipps noticed before Google code doesn’t list AGPL and other ‘minority’ licences as an option (by selecting the “Other Open Source” you can write at hand any other OSI approved license). But, are the missing licenses a minority? Not quite, at least reading BlackDuck Top 20 most used licenses list, in fact the Microsoft Public License has been stripped off from the list. Also looking at the list of Microsoft’s CodePlex hosting platform set of allowed licenses not all most used licenses show up in the list (among missing licenses the Artistic License, and the GPLv3). 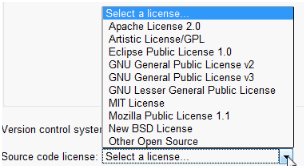 By selecting the “Custom License” apparently you can choose any license, proprietary included. Searching code. If we search for a program we can’t specify a given license using Google Code search, but “labels” let you sharpen the search. 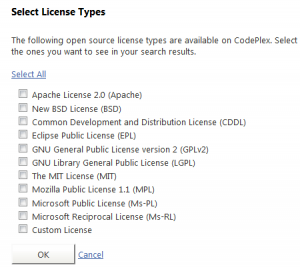 Microsoft CodePlex search allows to sort projects by few different criteria (downloads and rating included) and provides an advanced search that allows to specify “Development Status” and “License Type”. On the contrary Google considers download statistics a private information, a decision that priviliges privacy versus transparency. Version control systems. Google makes available two choices, both based on open source tools (Subversion and Mercurial), while Microsoft allows users to use its proprietary Team Foundation Server (made available also via Subversion clients) and Mercurial. On ground of intersecting highways, I would consolidate my alliances. Both platforms keep evolving, either making new features available or collaborating with other open source projects, and are both working on target end-use “species”. Any decisions around licensing, available tools, import/export facilities, users’ reviews and feedback, etc can make a difference. For example looking at the AGPL incremental rate, I noticed that among copyleft licenses the AGPL was the fastest-growing license. Thanks to BlackDuck Open Source License page I easily managed to make an update, see the table below. Make or not AGPL projects first class citizens is one of these strategic decisions.